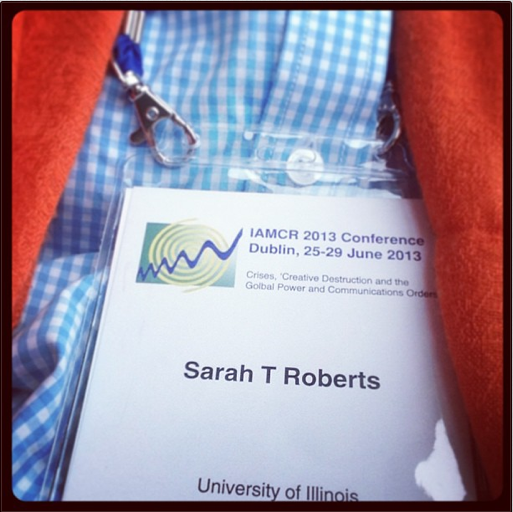 Posted on June 28, 2013 March 3, 2015 by Sarah R.
My IAMCR badge, marking the last time I’ll be wearing a University of Illinois affiliation. It’s been a whirlwind of a week in Dublin, Ireland, as I’ve been visiting with colleagues and participating in IAMCR13. The conference has been time well spent, with a critical mass of critical media and communications scholars assembled in one place to talk about very real issues. At the fore has been that of continued economic crisis, austerity and related topics – topics quite relevant in Ireland today, as a massive banking scandal and attendant fallout rocks the country, with very little accountability to be had on the part of the bankers responsible. Meanwhile, the Irish Times put a guide to debt in the Thursday issue I picked up. I was pleased, therefore, to present today at this conference and among two very esteemed friends and colleagues, Ergin Bulut (University of Illinois) and Miriam Sweeney (University of Alabama), and Victor Pickard (Annenberg School, Penn). I shared work on commercial content moderation, while Ergin presented a fascinating aspect to his dissertation work on gaming companies: the feminized invisible labor of gaming developers’ spouses. Miriam Sweeney shared her work on anthropomorphized virtual agents (AVAs), troubling aspects of design and HCI that often believe themselves to be value-neutral and demonstrating them as sites of deep instantiation of cultural, racial and gender norms and stereotypes. Pickard shared his historical analysis of newspaper journalism of the 1930s and 1940s not as the halcyon days so often juxtaposed with today’s journalism in crisis, but as a contested time for print journalism, when a laissez-faire relationship so often presumed between government and journalism was not necessarily the case. It was a pleasure to have a nice turnout for the panel; in the audience were several familiar faces, including that of Christian Fuchs, who prompted the panelists to find a theoretical thread or theme that might tie all the papers together. The panel responded as a group, and the audience also brainstormed on the question, with obfuscation, dismantling mythologies, issues of power and control, unveiling the human in infrastructures and systems (this from Lisa Nakamura) all contenders. In the end, the panel fielded many engaged and provocative questions from the lively participants in the audience, and the experience was marvelous. Thanks to those who attended; we look forward to sharing our work further with you. On a personal note, this conference marks the last time that I will be in attendance as an affiliate of the University of Illinois; as of Monday, July 1st, I am very pleased to take up my post as Assistant Professor in the Faculty of Information and Media Studies at Western University.